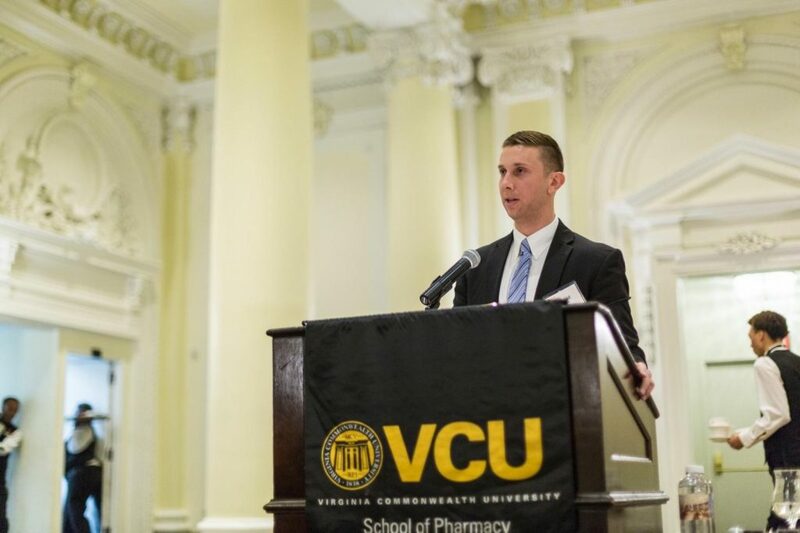 David Doan speaks to alumni of the VCU School of Pharmacy at the Jefferson Hotel during the school’s annual Galen Society banquet. From the author: Each person in my class is remarkable in his or her own way, especially to have come this far in pharmacy school. However, a dozen of them have inspired me in one way or another, and I wanted to share their secrets to success because I believe that we all can, and should, grow immensely as people and as pharmacists in this school. So for each article in this series titled “OTC Advice” I will interview and write about a classmate who has inspired me over the past three years, whether it was inside the classroom, outside the classroom, or both. I consider their advice OTC — “over the counter” — since no prescription is necessary; just open a web browser and spend a few minutes reading. David Doan, a third-year pharmacy student at the VCU School of Pharmacy, has amazed me in numerous ways. He has served as class president for his first two years in pharmacy school and is now the student body president, and he has served in other leadership positions in various student organizations. Above all, he consistently embodies professionalism and friendliness, always offering a smile, a laugh, or a refreshing conversation even on our roughest days. If I could summarize his following advice in a few words, it would be this: We all want to see each other succeed, whether it be through learning through mentors, learning a variety of different skills, or learning how to solve problems. So say “yes” to each challenge that the faculty, staff and your own classmates offer as learning opportunities. You might be impressed with how much you can grow as a person and as a pharmacist. Auxiliary Label: Why did you apply to pharmacy school? David Doan: I chose to apply to pharmacy school because I had great respect for one of my mentors when I was working at the NIH [National Institutes of Health] who happened to be a pharmacist. I saw his job and what he was doing, and I wanted to do that. He had a Pharm.D. and an MBA and he ran a research lab at the NIH, and it’s something that I could see myself doing. What did you like most about what he did at the lab? I liked the variety of things that were going on at the lab, whether it be support for clinical trials, his own research in prostate cancer, or learning leadership techniques. It really taught me a lot. What is your favorite thing about pharmacy school so far? I just love to learn. Every single day you walk through these doors, you can learn so many different things, connect with so many different people, and build relationships. The school allows you to do that, and you walk out of these doors when you finish as a better person and a great pharmacist. If you could be any faculty or staff member in the school, who would you be and why? Dr. Gravatt. I think she’s amazing. She’s so well-rounded, she provides all of her students with the knowledge and skills, and she shares her experiences us and tries to make us better. She challenges us. She’s a great mentor. And she genuinely wants to see all of us succeed. How do you think you have grown as a student and/or a pharmacist over the last three years? Outside of the clinical aspects — learning pharmacy itself — it’s really about the ability to interact with people and with patients. It’s more about the soft skills. Being a pharmacist is more than just medications – you’re a professional problem-solver. Whether it be logistics, medication issues, or clinical situations, you’re the go-to for being that problem solver, and I think that’s what I’ve learned most. If you could give your P1 self the most important advice or lesson you have learned so far in pharmacy school, what would it be and why? Don’t be afraid to take on new challenges. Be someone that always says yes. The more opportunities that you seek out and go for, the more doors will open. And cherish the time you have here; it’s short, and after this, it’s real life. So, take advantage of it, and take advantage of the opportunities that the School gives you because they provide so many. And don’t be afraid to step outside your comfort zone. Try to grow as much as possible. The more that you grow here, the better pharmacist you’ll be and the better care you’ll be able to provide your future patients.